Then attend @LiteracyShed Conference Old Trafford. Superb use of videos from Rob Smith for creative writing. Impressed to find them all in one place rather than trawling YouTube myself. Next up @ICT_MrP. Inspirational ideas when using i-pads and camouflage learning. Liked Blackfish. Store that for future reference! @InspiredMind5. #geektastic. Book for Village in Ashton. Order Comics in the Classroom. Start collecting resources for September. Next to Davyhulme Primary for iPads in the Classroom training from Mr Parkinson. More inspirational ideas to take back to class and start using with my 15 iPads. Children don’t see it as work, all motivated and working together, sharing and bouncing ideas of each other. New IPC Unit of 'Climate Control.' Watched Midway – Message From The Gyre with my class. Stunned silence. Tears rolling down some faces, both adults and children! What can we do in Radcliffe about that? Write about it? Discussion/Argument Text? Boring! Inspired by Mr P's Blackfish project- Can we do something similar? Left children to plan and each came up with question. Each came up with answer. Sort into order of importance. Use images from film as backdrop. Film each student reading question. Film each student giving response. Harry (Digital Leader) edit using i-movie. Add music – Albatross/Fleetwood Mac (Only bit I did!) 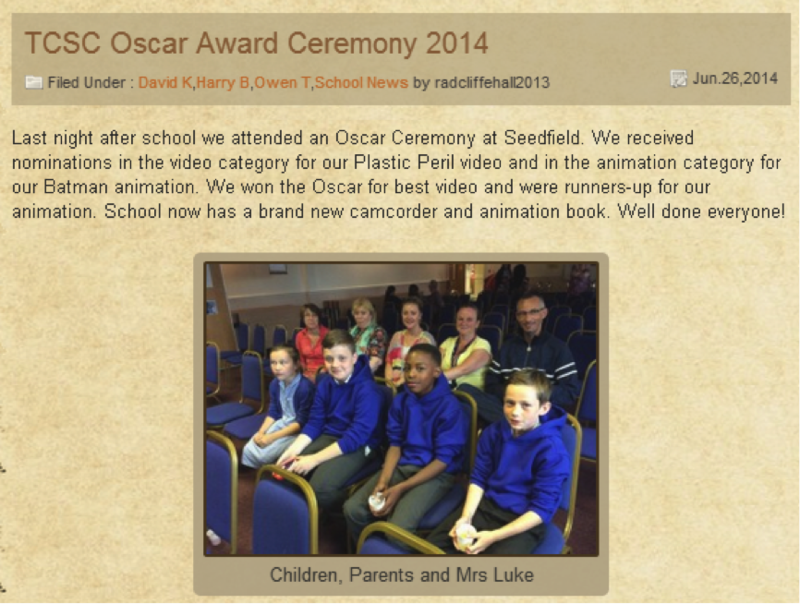 Watch and post on class blog. Enter for Primary Earth Summit. 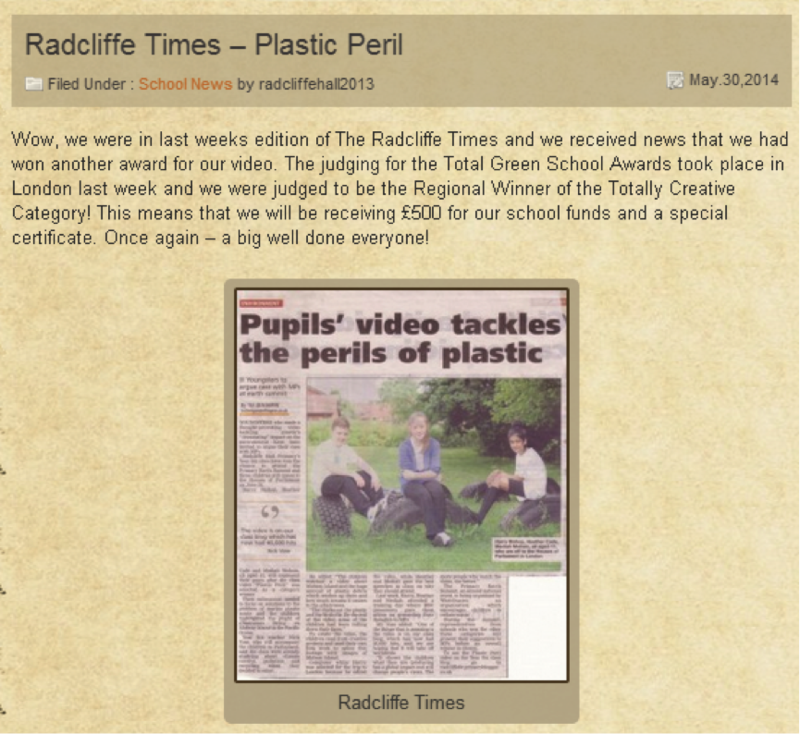 Enter for Totally Green School Award. Enter for TCSC Oscar Awards. Wait and see. Visited Richmond Primary School in London, with Harry, Mediah and Heather for training with BBC presenters. Harry came for editing film. Mediah and Heather as they prepared the best speech for why they should represent class at Parliament. Day spent at The Houses of Parliament will be one that none of us will ever forget! So proud to see our Year 6 telling MP’s they need to tackle plastic pollution in the ocean. Mrs B (Class TA) cried all the way through their speech! Awesome probably sums up the whole experience from start to finish. My thanks to Lee for sharing so many wonderful ideas on his blog, without which, this experience would not have been possible. - Many thanks to Nick for this, great to see how an idea can be adapted and used for another topic. It is fantastic to see how far the video went and the success you had from it. I am sure the class will remember this exciting project and the inspired work that they produced!